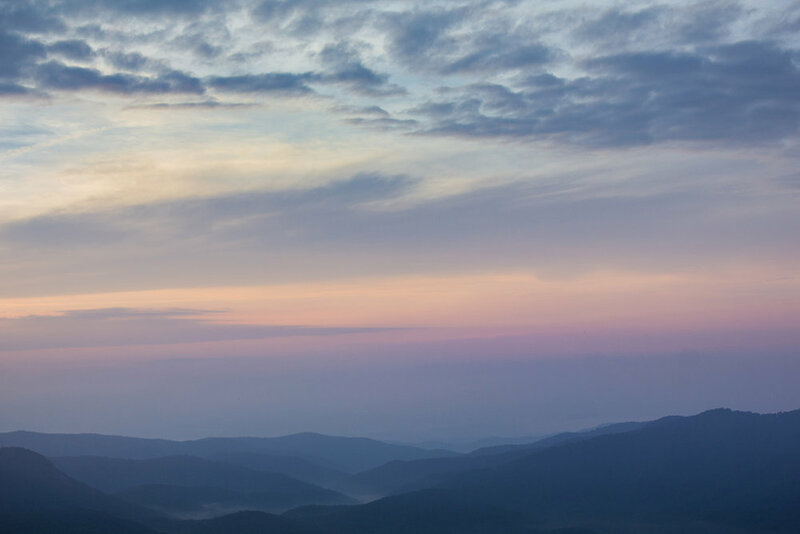 A few weeks back we woke up at 4:00am, loaded our day packs in the truck and to drove up the Blue Ridge Parkway in the dark to hike Black Balsam, Tennent Mountain and Ivestor Gap loop. It's been several years since I've been on the trail at Black Balsam, so the trip was long overdue. At an elevation of a little over 6000 ft. Black Balsam and the surrounding area have always been one of my favorites, especially considering how distinct the landscape is from where we live in the lower mountain elevations. 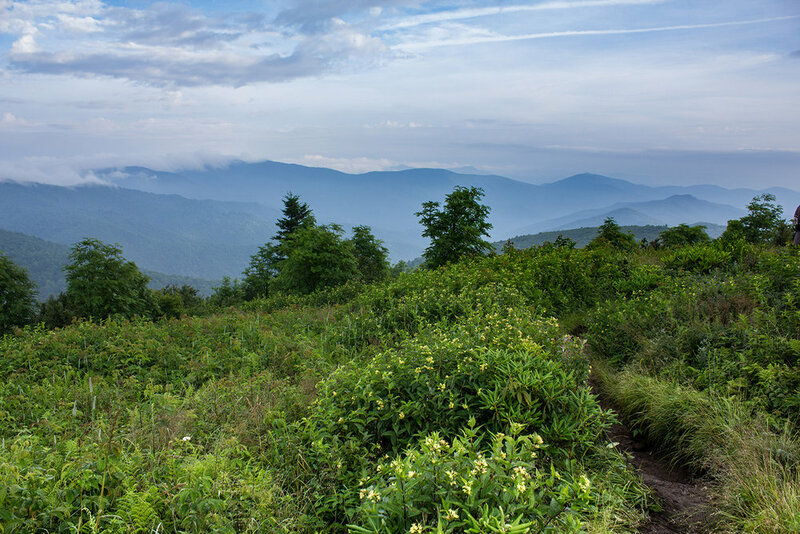 The wide-open grassy balds offer a different hiking experience than many of the more heavily forested trails in the area and provide some incredible views of the Southern Appalachian mountains. Another great thing about the elevation is that temperature is about 15 degrees cooler, so it's a great break from the sweltering heat of late summer. Below I'll break down a little more information on each section of the trail and at the end give a few tips for hiking this trail and others in the immediate vicinity. Overall the hike barely broke 5 miles total and if you start the loop from the Art Loeb Trailhead, you'll get the hardest part of the hike out of of the way first. We parked the truck in the parallel parking at the base, but you also have the option of more parking and restrooms further down the road at Sam Knob. The beginning part of the hike climbs fairly quick and is pretty rocky terrain, but once you get to the top of Black Balsam things level out so you can really start to enjoy the views. There's nothing like watching the mist slowly clear from the valleys below and see the clouds start to open up as you amble along the trail in the early morning hours. While we enjoyed the Black Balsam portion of the trail, the downside of this section was that there were a lot of people camped along the trail up and on top of the summit, so there wasn't too much peace and quiet. 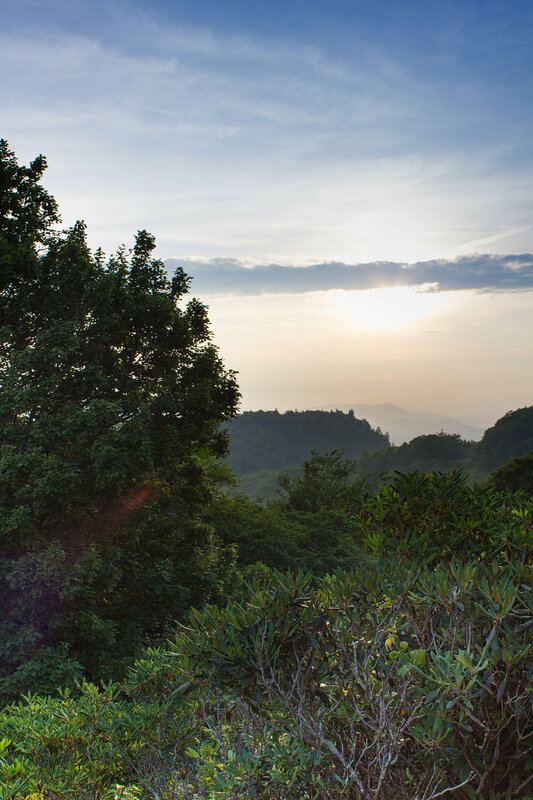 Also if you plan to photograph sunrise remember that even though you are at a higher elevation (meaning the sun is visible earlier), it can be pretty hazy in the morning due to the typical humidity of summer in the South. We were surrounded by mist the first part of the hike and didn't get a clear line of sight until a little later that morning after we moved on to other parts of the trail. The Tennent Mountain portion of the loop hits more of that isolated backcountry feel that we love, but unfortunately didn't have time for this day. In fact the other other noise we heard were the birds chattering away in the blueberry bushes and coyotes periodically calling out to each other across the valley. 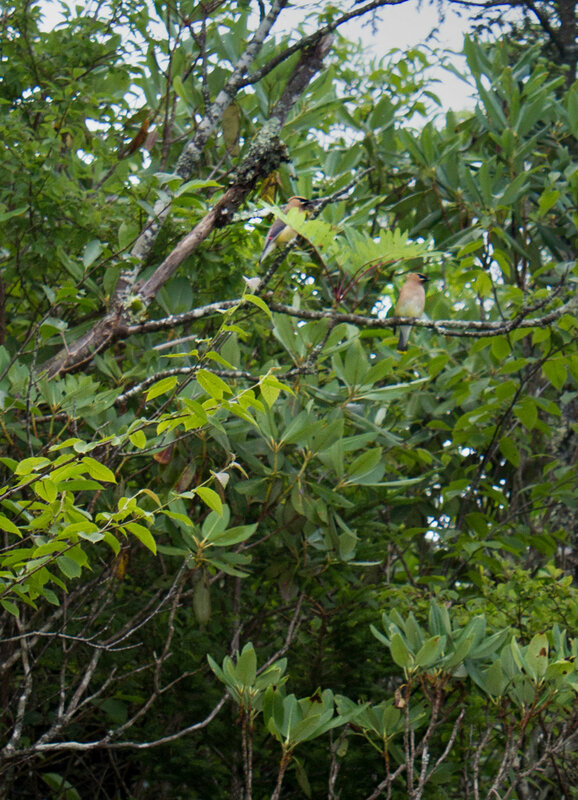 This portion of the trail was a haven for cedar waxwings, brought in by the impending crop of blueberries. Another great thing about this elevation is that the rhododendron come to full bloom in June and there were actually still quite a few blooms when we were here in July. In several areas of the trail these bushes are quite high and the trench is fairly deep and a little dark, so navigating this part of the trail gets a bit tricky. I would highly recommend wear sturdy shoes and make sure to keep your eyes on where you're walking to avoid twisting an ankle. Where the Art Loeb trail meets the Ivestor Gap trail is where we decided to turn back and complete the loop to where we left the truck. There's a large rock at this junction that is a nice stopping point for a snack and to take in some more sweeping views, including both Looking Glass and Shining Rock. 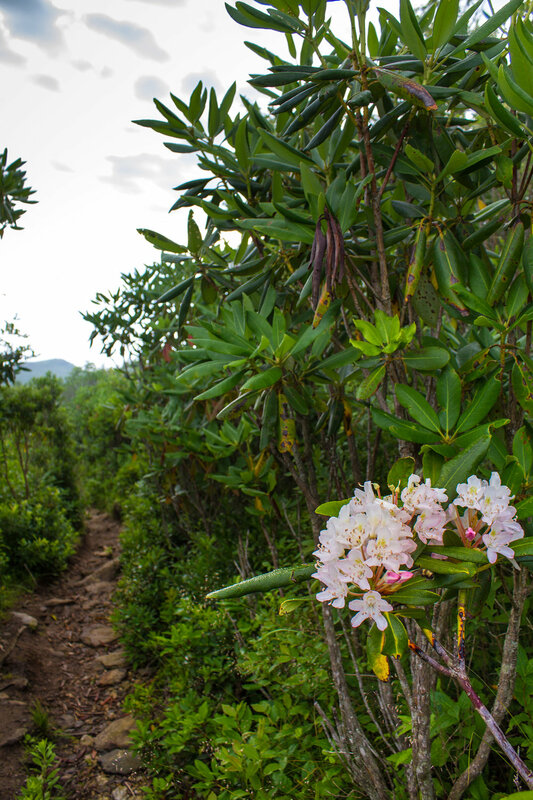 The Ivestor Gap trail takes you back towards civilization through cathedrals of pine trees decorated with more twisting rhododendrons. A large section of this trail belongs to a creek bed and is often saturated with water after heavy rain, so as I mention below, waterproof shoes are a nice luxury to have in this stretch. The closer we got to the Sam Knob parking area the more people we passed heading out or even just set up to paint plain air or read along the trail. We completed the loop at about 9:00am and I won't lie, it's a nice feeling to get in a 5 miles before most people have even gotten out of bed on the weekend. Plus the early morning hours often provide more opportunities for dramatic light and wildlife sightings than later in the day, talk about a win-win. Arrive early. This means you beat out a lot of other people and gives you a lot more peace and quiet to enjoy the hike. Spray your clothing. 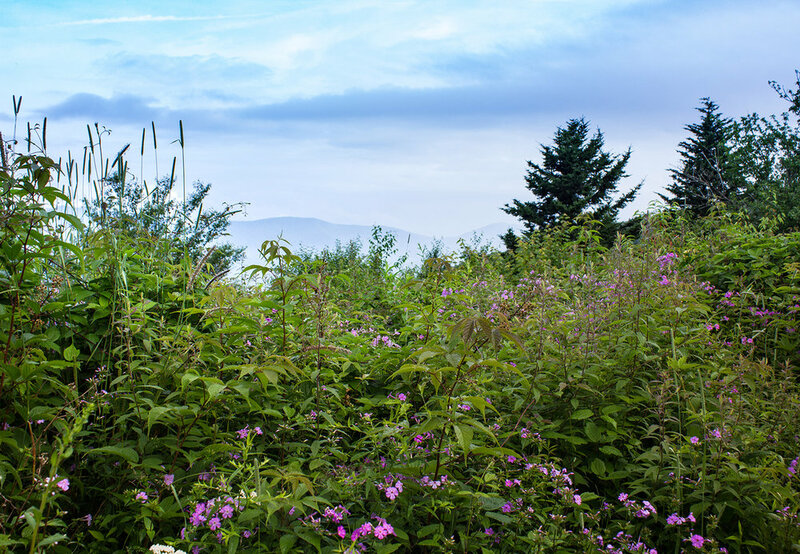 In the summer the grasses and bushes are quite high, so I recommend wearing pants and spraying clothing the night before with a Permethrin spray to ward off any ticks and other nasty insects. Wear pants. 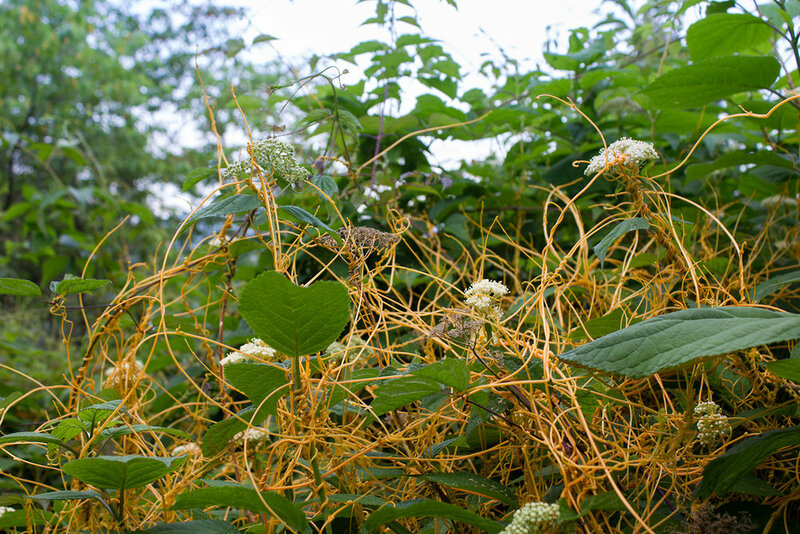 The grasses and brambles you walk through in some areas will easily scratch your legs and a lot of the vegetation is soaking wet with dew in the early morning hours. Waterproof Shoes. On a similar note a lot of the trail has deep trenches and creek beds that collect water, so waterproof shoes will help keep your feet dry in the muddy terrain. These are currently my favorite light trail shoes of choice because they do a great job of keeping my feet dry in wet conditions like these. Watch out for campers. Summer is easy camping weather and the summit usually has a lot of people camped out. The day we went there were at least 10 different groups scattered across the summit that had been camped out the night before and some of them were still dead asleep as we were hiking through. Keep tabs on the weather. Summer storms can roll up quick in Southern Appalachia, especially at higher elevations. Be conscious of the weather and always have some rain gear just in case. Be aware of wildlife. I feel like this is a given, but a large portion of the trails are covered in blueberry bushes in late summer that attract a ton of wildlife to the area. Keep your eyes open and ears open. We saw two bears as we were driving back home on the parkway. Watch for off-shoot trails. The top of Black Balsam can be a little confusing because there are several smaller trails that turn off that main one to explore the summit. Stick to the one that is most defined in order to stay on the Art Loeb to Tennent Mountain. There will be off-leash dogs. One of the main reasons we don't take Tennessee with us on heavily trafficked trails like this one is that there will always be someone with a loose dog or a small dog on a retractable leash. Now this is something that we are conscious of because Ten and I had been attacked by loose dogs twice while living at our previous house, which means she is extremely wary of meeting new animals, especially ones that come up and invade her space. If you have a dog that is similarly cautious, be forewarned that there are pretty high odds you will run into someone that is working off the knowledge that their dog is nice to everyone, but is possibly not taking into consideration that your animal might need space on the trail. 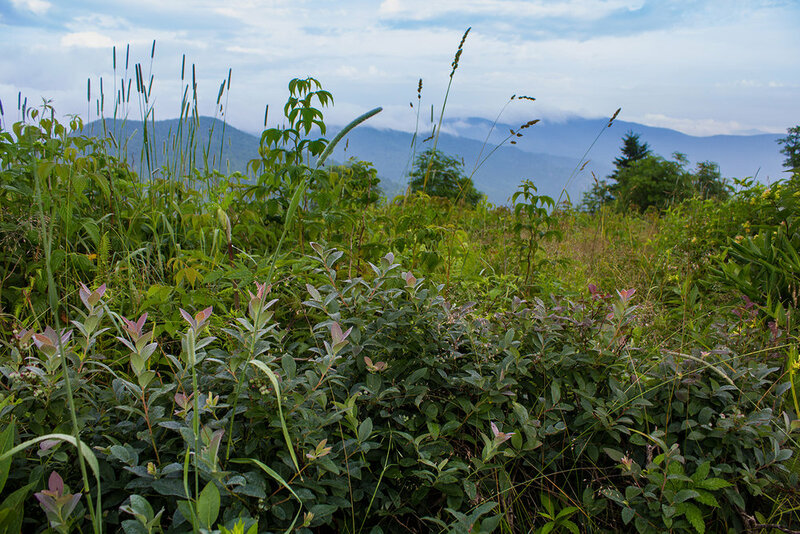 Hope you enjoyed these tips and reading about our most recent experience hiking the Black Balsam, Tennent Mountain and Ivestor Gap Loop in the Pisgah National Forest. 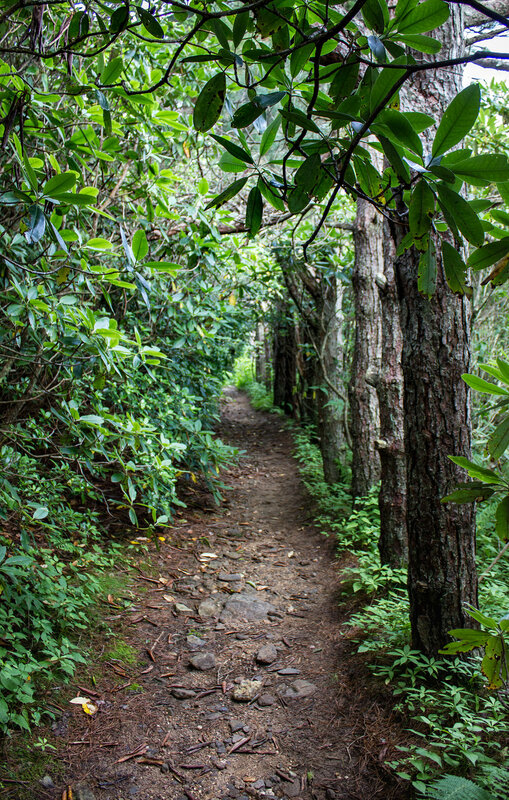 We're planning on heading back up this way in September for the Graveyard Fields Trail. This will be a new one for me so if anyone has any tips or recommendations for this trail let me know in the comments below!